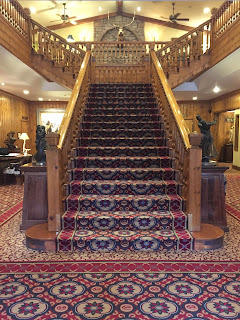 I thought it would be fun to share some of the places we visited on our trip out to Jackson Hole! Although it was quick for me - only 3.5 days - we packed in as much as possible. 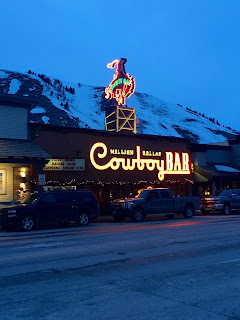 All eight of us skied everyday at Jackson Hole Mountain and then either hung out at the condo for dinner or went into Teton Village, the town at the base of the mountain, or Jackson, a 15-20 minute drive away. 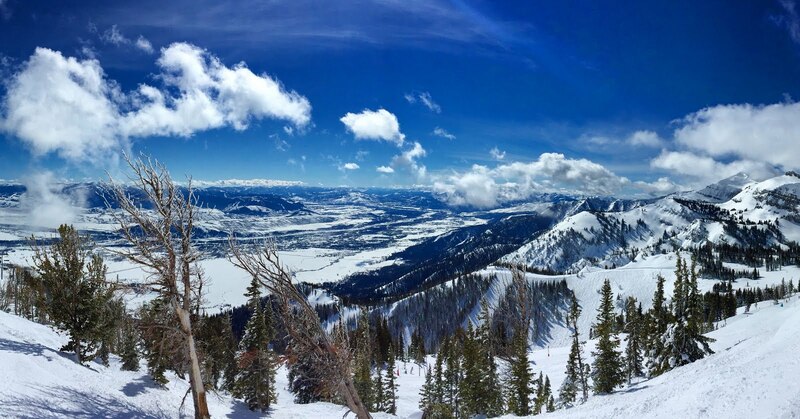 Although skiing is the main attraction (I highly recommend taking lessons at Jackson Hole if you've never skied before - it's where I learned to ski when I was 2!) below are some of my shopping/dining recommendations. The Handle Bar // This is at the base of the mountain and has great outdoor-seating with plenty of fireplaces. 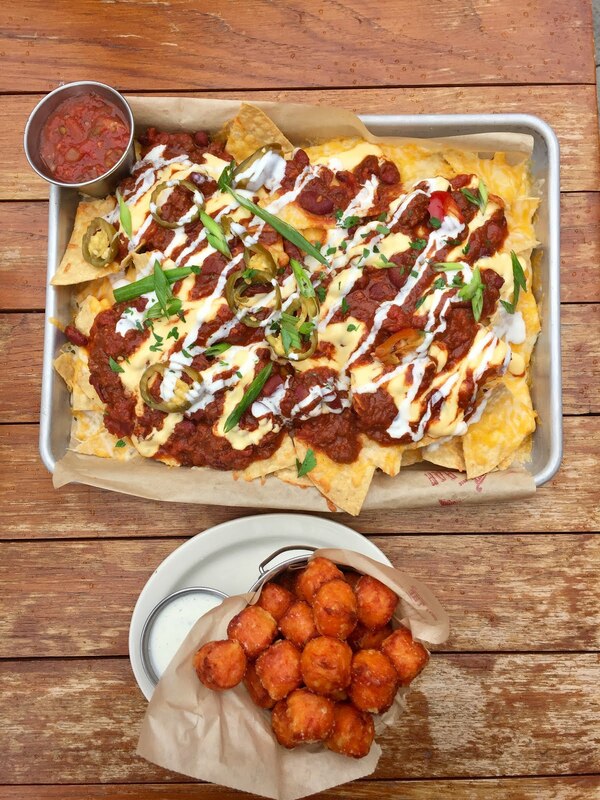 John and I stopped here for lunch one day and ordered the nachos and sweet potato tots. They were both delicious and the portion sizes were huge, we couldn't even come close to finishing them. 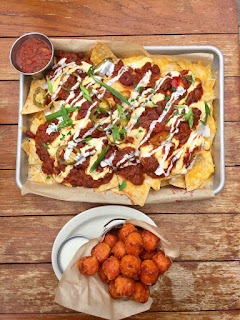 The Mangy Moose // This is kind of the "it" spot for après-ski drinks and apps. The bar room gets packed so we ended up sitting in the lounge, but it's still a fun atmosphere and great drinks! You definitely have to come at least once! Teton Village Sports // It's basically right next door to The Mangy Moose, and has a large selection of rental equipment and a retail store with ski brands such as Patagonia, Arcteryx, Bogner, Norrona, etc. and everyday wear by brands such as Vince and Bailey 44. 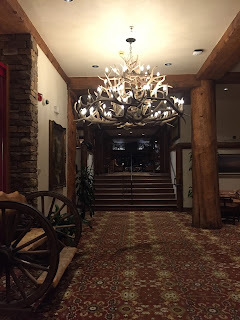 Gamefish // We went here for dinner one night and loved the look of the interior, with a grand fireplace, a chandelier made of antlers, rich-colored rugs and leather chairs. The menu selection was also great, with options all eight of us could enjoy. JH Sports // A huge store right at the base of the mountain with a selection of Jackson Hole merchandise as well as skiwear from The North Face, Mammut, Patagonia, Mountain Force, Black Diamond, etc. picked me up from the airport and was surprised to find such a trendy and minimalist café in the middle of a western town in Wyoming. 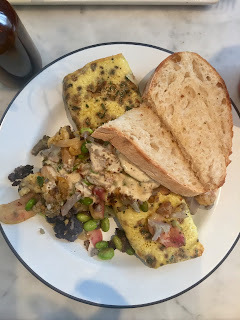 The food was great (I had the herbed goat cheese omelette with watermelon radish) and the interior was beautiful - plus it's right in the middle of Jackson! Jackson Mercantile // John and I stopped in here expecting to find souvenirs and were surprised to see a $29,000 stuffed grizzly bear for sale along with zebras, moose, squirrels, foxes, etc. It's definitely worthwhile to spend some time just perusing the store and looking at all the different animals. I brought my parents to the store as well and they loved it! Million Dollar Cowboy Bar // This is probably one of the more famed institutions of Jackson Hole. The bar is lined with silver dollars and the bar stools are actually saddles, which were surprisingly comfortable and made for a unique experience. Definitely stop by for a pre-dinner drink! Pinky G's Pizzeria // This is a super-casual pizza place that we ate at the night before we flew out, but the pizza was great and the vibe was relaxed and fun. Perfect for when you're exhausted from a day of skiing and just need to carbo-load. MADE // If you love quirky greeting cards, throw pillows, mugs, and other homewares then don't miss MADE. They also have some Jackson Hole merchandise, making use of the infamous cowboy motif on various glassware and tchotchkes. before we flew out. 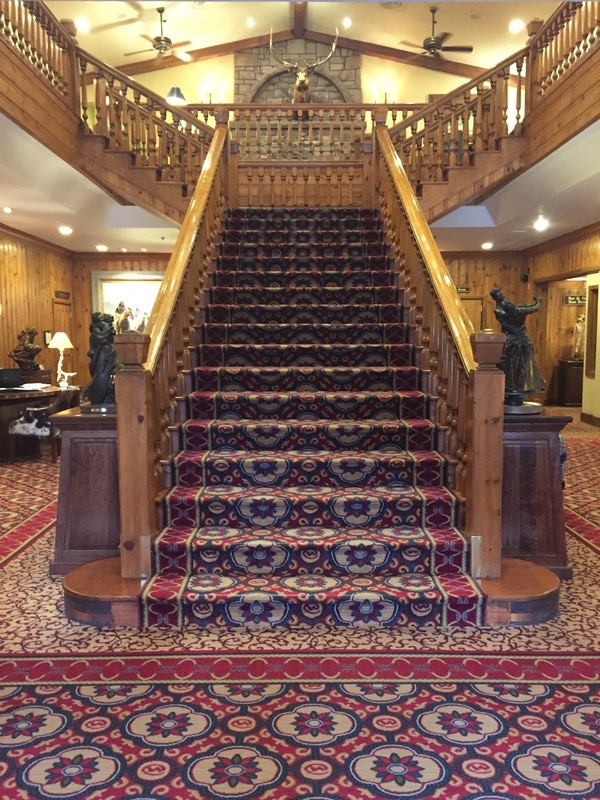 The hotel has the classic wild wild west vibe and historic charm, having been around since 1941. The interior is so cozy and well-decorated and although we weren't there for very long, we enjoyed every minute! 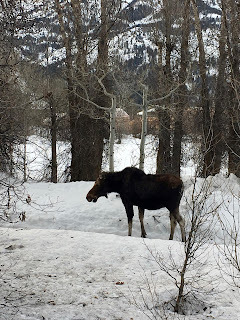 Lastly, here's a picture of the moose we kept seeing on our drive from Teton Village to Jackson and back! It was my goal to see one during this trip, and I actually ended up seeing five! This one seems to live right on the road and couldn't have cared less about us, which was nice to see after hearing so many horror stories lately about people being chased by moose! p.s. To keep up with my travels follow me on Instagram @blondebowhemian! Happy Spring Break and Safe Travels! p.s. Check out some of my snaps on Instagram while I'm out there @blondebowhemian! After season upon season of dainty jewelry filling magazine spreads and Instagram feeds, it seems statement jewelry is finally having a resurgence, especially when it comes to earrings. You can always find me wearing some sort of earrings, a watch, and a necklace, otherwise I feel naked. Usually I stick to stud earrings (these or these), but I love more dramatic ones to really dress up an outfit. 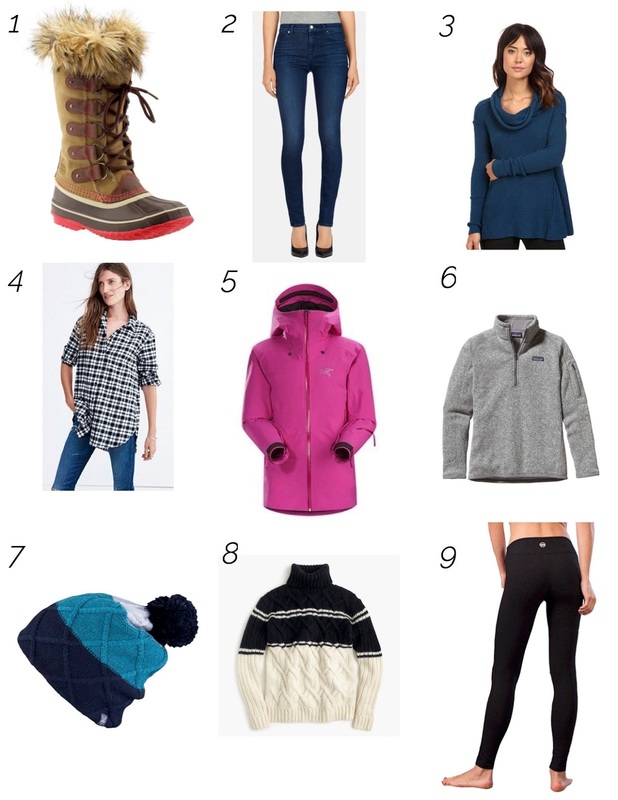 Below are some of my favorites this season!